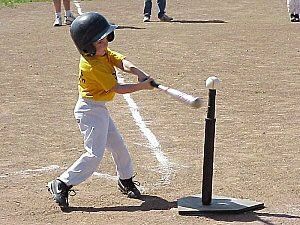 T-ball is the first level of baseball that introduces the structure of the game. The players are taught the fundamentals of the game over the course of the season. A regulation game consists of three innings where every player bats each inning. A small ‘softie’ ball is hit off an adjustable tee. When in the field, players will be rotated through the various defensive positions ensuring that they have opportunity to play both infield and outfield positions. Players are assisted in the field by their coaches in executing defensive plays. Winning and losing are still not emphasized at this initiation level. The primary focus is making sure the players have fun while introducing the game of baseball.